Rayne Dakota Prescott popularly known as Dak Prescott played as a student-athlete for the Missipi State Bulldogs while in college, afterward, he was selected by the Dallas Cowboys in the fourth round of the 2016 NFL draft as he began playing as a quarterback in the league. Dak got off to a good start as he was recognized as the NFL Offensive Rookie of the Year and was also selected in the Pro Bowl Selection. He is widely acclaimed as a player bound to do exploits in the league seeing that he has broken a lot of records set by the likes of Robert Griffin III and other skilled NFL players. His educational pursuit started in Haughton High School where he was an active football player for the Buccaneers and in his days at Haughton, he was named the 2010 District 1 AAAA Champion after which he set course for college and arrived at Mississippi State University. Young Dak was redshirted as a freshman with the Mississipi State Bulldogs in 2011, he then played as a backup to Tyler Russel in the 2012 season from which he saw college football action in 12 games. By 2015, he was named the National Player Of The Year Candidate and was also chosen to participate in two Preseason All American Teams. Dak Prescott attained was in top form in his games for which reason he gained some national recognitions such as emerging as a finalist for the Jonny Unitas Golden Arm Award, a semifinalist for the Maxwell Award as well as the Davey O’Brien Award. This was in addition to his being awarded the Senior Class Award. His professional career kicked off with the Dallas Cowboys in 2016 after being selected in the fourth round of the 2016 NFL Draft as the 135th overall. Dak became the first quarterback in the history of Dallas Cowboys to wear jersey number 4. He started his first season making 176 attempts which broke the record of 162 attempts set by Tom Brady for the most consistent pass attempts without hitting an interception. The rookie finished his first professional season with a record number of 11 games played, beating over 100 NFL passer rating and breaking the record of 9 games set made by Russell Wilson in 2012. Robert Griffin III set a rookie record of 102.4 in 2012 and a record of 1.27% interceptions to attempts that same year, however, Dak Prescott broke the record by attaining a passer rating of 104.9 and a 0.87% interception to attempts. He did excellently well and has recorded 23 touchdowns and 4 interceptions for touchdowns to interception ratio of 5.75 countering the record set by Robert Griffin III; his rookie record of 4.00 consisting of 20 touchdowns and 5 interceptions. In 2016, he broke the single rookie game record with an 88.9% against 87.0% attained by Mike Glennon in 2013. All through the seasons, Dak played excellently well and had a few wins and losses too. He was named the NFL Offensive Rookie of the Year in 2016 and was ranked on the NFL Top 100 Players Of 2017 where he emerged as the 4th position. He ended his second season recording 3,324 passing yards attaining 22 passing touchdowns with 13 interceptions and 357 rushing yards in addition to 6 rushing touchdowns. Dak Prescott was born on July 29, 1993, to an African-American dad and a European-American mom; Nathaniel and Peggy Prescott respectively. He was the youngest of three siblings in which Tad and Jace are his older brothers and his older sister is Natalie Prescott Smith. He also has a half-brother named Elliot Prescott from his father’s previous marriage. Unfortunately, the family lost their mom; Peggy to the cold hands of death after she battled with colon cancer in November 2013. In a bid to honor his mom, Dak founded the Faith Fight Foundation; a foundation set with the sole purpose of helping those who are in adversity. His love for his mum is not questionable as he also wears the jersey number 4 as a recognition of the day of her birth-September 4. Kayla Puzas was Dak Prescott first publicised girlfriend. The duo started their relationship in 2014 and couldn’t take their eyes off themselves. Their relationship was no secret to their fans as they constantly uploaded their details on social media platforms. However, in 2015 a breakup happened between them which in annoyance led both of them to remove all the records of their relationship on social media. For a while, Dak remained single and finally found love with Yasmine Nicole who is a super hot model. They began their relationship in September 2016. Just like his relationship with Kayla, the duo also publicised their relationship in like manner with picture uploads of their activities. 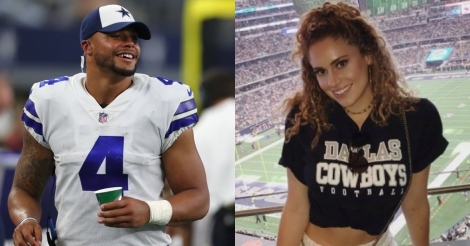 Their relationship blossomed, however, it is been rumored that the Dak Prescott has taken interest in a Las Vegas waitress named Rosette Abud, we wouldn’t give a total trust on the rumors, nevertheless, it looks like the duo has hit it off perfectly. As an athlete, Dak Prescott looks super hot with a well defined muscular structure having six packs and abs. He stands at 6 feet 2 inches with a balanced weight of 103kg. Unlike most NFL players who carry a dread, the footballer carries his black hair short and possesses a set of brown eyes. He measures 47-16-35.5 inches for his chest, biceps and waist size respectively. You wouldn’t expect less from Dak Prescot as he is a team player for the richest football league in the world (NFL). His 4-year contract with the Dallas Cowboys was worth $2,723,393 including a $383,393 signing bonus and at the time of the contract in 2016, his annual salary was $680,848. In 2017, his annual salary was $540,000 and was estimated to be worth $2 million. He was ranked the 60th richest in all NFL quarterbacks and the 999th richest in the whole of NFL players. Dak has attained a $726k cap hit which invariably means that his cap hit for 2018 would be 0.4% of the Dallas Cowboy cap total for the season. Moreso, his net worth for the year is still being reviewed.